We are also manufacturing Cefixime + Ofloxacin in Dry Syrup form. Cefixime Trihydrate is an oral third generation cephalosporin antibiotic used to treat infections caused by bacteria such as pneumonia; bronchitis; gonorrhea; and ear, lung, throat, and urinary tract infections.Cefixime is used to treat many different types of infections caused by bacteria. Cefixime may also be used for other purposes not listed in this medication guide. Ofloxacin is a synthetic chemotherapeutic antibiotic of the fluoroquinolone drug class considered to be a second-generation fluoroquinolone. Elimination: About 50% of absorbed dose is excreted unchanged in the urine in 24 h. Serum t ½averages 3 to 4 h, but may be as long as 9 h in some healthy subjects. Absorption: Following oral administration, the bioavailability of ofloxacin in the tablet formulation is approximately 98%. Maximum serum concentrations are achieved one to two hours after an oral dose. Elimination: Elimination is mainly by renal excretion. Between 65% and 80% of an administered oral dose of ofloxacin is excreted unchanged via the kidneys within 48 hours of dosing. Four to eight percent of an ofloxacin dose is excreted in the feces. This indicates a small degree of biliary excretion of ofloxacin. 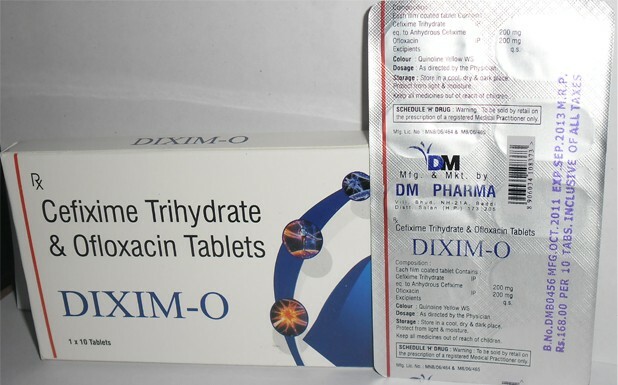 This tablet is one of the combination of cefixime (cephalosporin) and ofloxacin (fluoroquinolone) and has unique dual mode of action i.e in this combination ofloxacin prevents nucleic acid synthesis of bacteria and cefixime inhibits bacterial cell wall synthesis.It is useful for killing thr ESBL (Extended Spectrum Beta-lactamase) bacteria.Both works instantly and synergistically and gives better patient compliance. Cefixime is an antibiotic, is a third generation cephalosporin like ceftriaxone and Cefotaxime.Cefixime is highly stable in the presence of beta lactamases enzymes.Cefixime is an effective treatment to stop the spread of several bacterial infections. It is often used as a treatment for gonorrhea, pharyngitis, typhoid fever and tonsillitis.ofloxacin belongs to fluoroquinolones group of antimicrobials i.e.-These are the quinolones having one or more fluorine substitution in their structure.Ofloxacin used to treat pneumonia and bronchitis caused by H.influenzae and S.pneumoniae.It is also used in treating skin infections caused by staphylococcus aureus and streptococcus pyogenes bacteria. Most of adverse reactions observed in clinical trials were of a mild and transient nature. The most commonly seen adverse reaction in a clinical trials of the tablet formulation were gastrointestinal and also adverse reaction have been reported for cephalosporin sensitive person and also in some cases nasopharyngitis, fatigue, dry mouth and pharyngitis and most were mild to moderate in intensity. This tablet is contraindicated In patients with known hypersensitivity to the cephalosporin or penicillin or fluoroquinolone antibiotics. Elevated carbamazepine levels have been reported when tablet is administrated concomitantly with carbamazepine salt and with warfarin and anticoagulantsdrugs, the prothrombin time is increased when this tablet is administrated concomitantly. Ofloxacin from chelates with alkaline earth and transition metal cations when administrated with antacids containing calcium, magnesium or aluminium, with sucralphate, with divalent or trivalent cations such as iron, or with multivitamins containing zinc. Elevated serum levels of cyclosporine have been reported with concomitant use of cyclosporine with some other quinolones. ● Prescribing Ofloxacin & Cefixime in the absence of proven or strongly suspected bacterial infection or a prophylactic indication is unlikely to provide benet to the patient and increase the risk of the development of drug resistant bacteria. ● Adequate hydration of patients receiving ofloxacin should be maintained to preent the formation of highly concentrated urine. ● Administer ofloxacin with caution in the presence of renel or heptic impairment. In patients with known or suspected renel or heptic impairment, careful clinical observation and appropriate laboratory studies should be performed prior to and during therapy since elimination of ofloxacin may be reduced. ● The possibility of the emergence of resistant organisms which might result in overgrowth should be kept in mind, particularly during prolonged treatment. In such use, careful observation of the patient is essential. If super infection occurs during therapy, appropriate measures should be taken. The dose of cefixime should be adjusted in patients with renel impairment as well as those undergoing continuous ambulatory peritoneal dialysis (CAPD) and hemodialysis (HD). ● Patient on dialysis should be monitored carefully. Cefexime should be prescribed with caution In individuals with a history of gastrointestinal dsease, particularly colitis.